The Hasselback potato is one of those seemingly fancy creations that’s actually deceptively easy to make. Cutting the accordion-like shape takes no time at all--seriously. But the more important point here is that you can fill all those crevices with exponentially more toppings (hello, cheddar cheese and bacon) than your average baked potato. ~ Preheat the oven to 400°F. Line a baking sheet with aluminum foil. ~ Use a sharp knife to cut the entire top of the potato into thin crosswise slices (about ⅛-inch thick), stopping about three-quarters of the way down the potato so the base stays in tact and the pieces remain attached to the base. 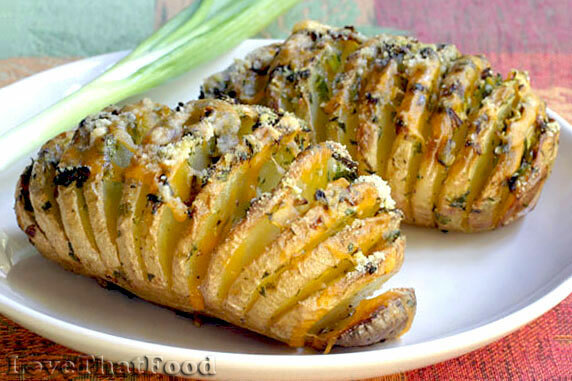 ~ Roast the potatoes until they are golden and easily pierced with a fork, 20 to 25 minutes. ~ Remove the baking sheet from the oven and sprinkle each potato with 2 tablespoons shredded cheese and 2 tablespoons bacon. Push some of the toppings between the potato slices. Return the baking sheet to the oven and cook until the bacon is crisp and the cheese is melted, 5 to 7 minutes more. ~ Let the potatoes cool for 5 minutes before serving.